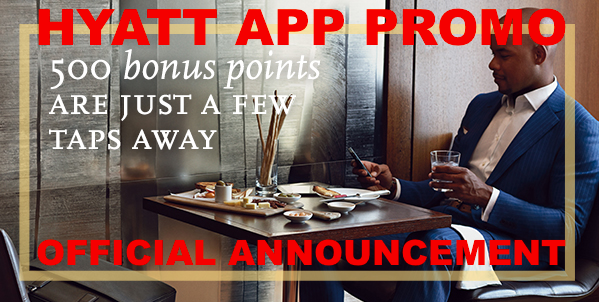 Hyatt Gold Passport Email Announcement For 500 Points Per Mobile App Booking Until November 30th 2016. 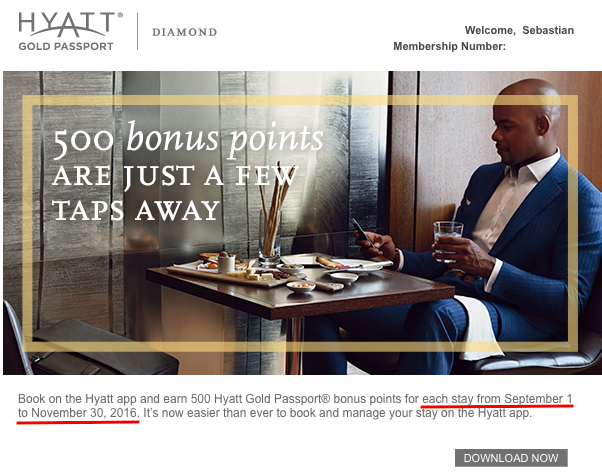 Hyatt Gold Passport has finally sent out an official email announcing the promotion to receive 500 extra points for each booking using the mobile application up until 30th November 2016. The promotion has so far been announced by word of mouth between members and from some Hyatt Reservation agents through the hotline. John wrote a quick piece about this two weeks ago when someone first reported about it on Flyertalk (access his article here). Now Hyatt sent out an official email announcement for the promotion, almost four weeks after it started. For all who were looking for something official before making their booking decision this should now suffice as such. The 500 points bonus is applicable to each stay booked per app within the promotional period. It’s once again typical for Hyatt to send out an announcement for a promotion weeks after it actually started rather than timely so that the customer can take advantage of it. The app also freezes or crashes every once in a while so you might not have the best experience using it as you might see. Previous articleReader Question: Iberia Won’t Through Check Bags To Qatar Airways When On Separate Tickets?